With the cost of housing continually on the rise, it is a given for most people nowadays that you will have to work hard for the next several years in your life, to even just scrap together a deposit for a home. Never mind the continual slog you’ll have to endure to pay the off the home. You could build your own log home for a small percentage of the cost of buying a home. No mortgage, no ties, just a simple home that belongs to you which can be enjoyed by the generations to come. So how do you do it? You’re certainly in the right place. We have tones of information about how to build your log cabin, from selecting the right location, to keeping your building costs down, to roofing your log cabin, and every step in between. Firstly though, let’s take a look at the most important thing involved in building a log cabin in the woods. Is Building A Log Home In The Woods Legal? 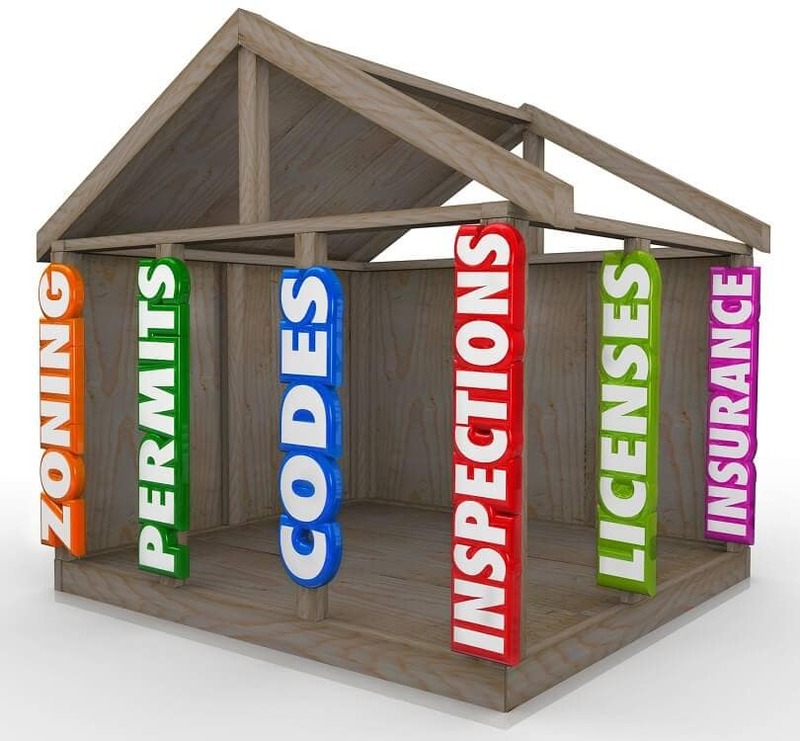 Different areas will have completely different zoning laws, building codes and planning laws so I recommend that the first step you take, is to check out the legalities of building in your local area. If you’re building in America, check out this article for more information. If you’re building a cabin in the UK, read this article. If you’re from somewhere else, drop us a comment in the section below and we’ll do our best to update zoning laws for your country. If you’re building your log cabin in the middle of a forest, there are a few logistics that you need to consider before you start planning your build. Firstly, how will you get the resources to your site? If you intend to use logs from the surrounding area, that’s brilliant. It’s even better if you can use logs in the immediate vicinity- this will save you transporting the logs through the woods. If you are sourcing the logs from elsewhere, this will require careful consideration. You may want to consider using reclaimed logs to save money and time. Make sure there are paths or roads in the woods to transport your logs to on a truck, or at the very least, a road nearby so that you can carry them to your site if need be. Although the logs are the basis of your log cabin, there are a number of other things you will need. Below is a list of the minimum amount of tools and materials you will need to build a cabin in the woods. For any of the tools that use electricity, you may want to consider hiring a generator for the duration of your build, or alternatively, just use hand tools. Using hand tools will increase the time it takes to build your cabin, however it is still entirely possible to build a log cabin using just hand tools. 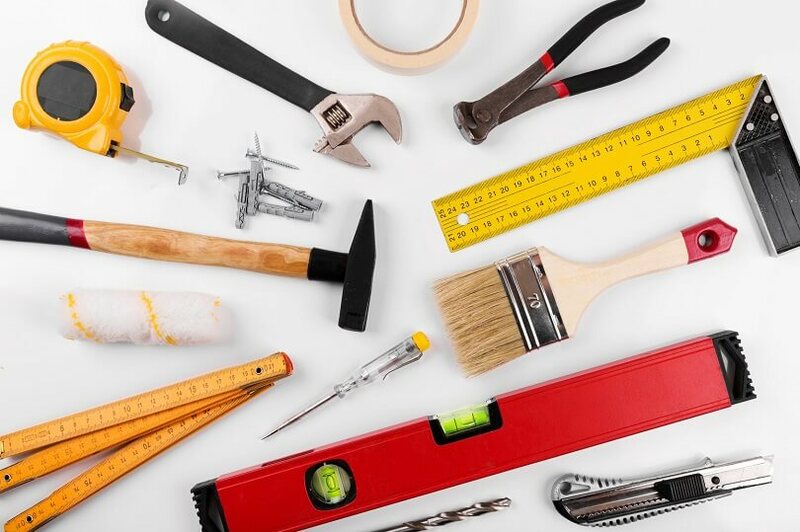 The amount and types of building materials that you need will change depending on the size, complexity and quality of the build you want to achieve. Foundation materials (this will depend on which foundation you decide to use). Logs (find out how many logs you’ll need). Insulation (choose your insulating material). Roofing materials (will you use wood shingles, roofing felt, tiles). For a breakdown guide as to how much this will cost you, have a look at our ultimate cost breakdown. Off Grid or On Grid? Before you start your build, in fact, even before you begin your planning process, you’ll need to establish whether you want your cabin to be on or off grid. The likelihood is, if you’re in the middle of a wood, there won’t be a convenient way to connect to utility lines. This means, you’ll either have to pay to be connected to electric, water and any other utilities, or you choose to live off grid. If you do choose to live off grid, make sure you read our off grid living tips. So you’ve decided whether you’ll live on or off-grid, and you know what materials you’ll need. Let’s move onto the actual build now. What follows below, only covers each stage very briefly. Follow each of the links for more in-depth information on each process. This first step is very straight forward. You should clear the site of trees, stumps, stones and shrubs. You need to make sure all the roots of trees are removed; they should be dug out and excavated completely, along with all other stones, debris and vegetation. The key thing you need to consider when clearing your site out in the woods is what you will do with the debris once it’s been cleared. You can either haul it off-site, which may be a big cost depending on how much and how far you are to the closest road. Alternatively, you can bury or burn the debris on site which is probably more of a realistic option for you. First, decide which foundation type you will use for your log cabin to sit on. Although log cabins require a foundation, they do not require a foundation that is as substantial as a brick and mortar home. 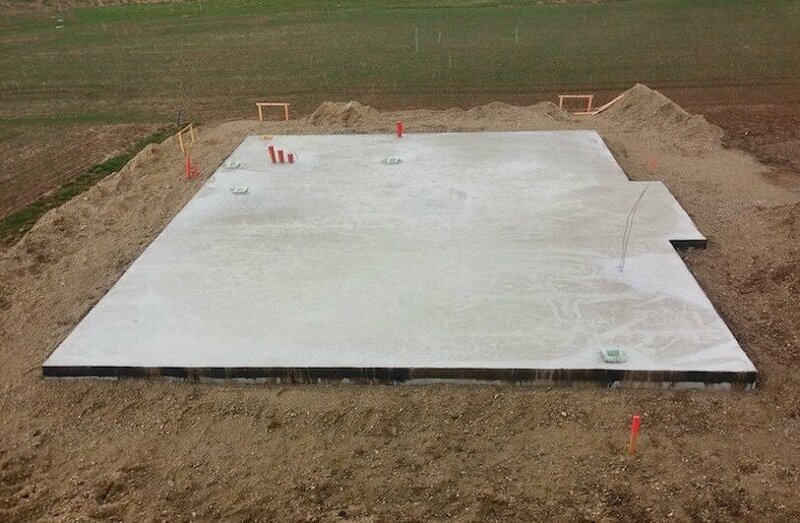 Therefore, you’ll likely want to choose one of the following foundation types: strip, pad or raft. Like your logs, you will need to consider how you will transport your foundation materials to your site. It may be that you need to clear a temporary path to your site while you are in the construction period. Felling trees is not difficult, but it is important to know exactly what you are doing, and how to remain safe. 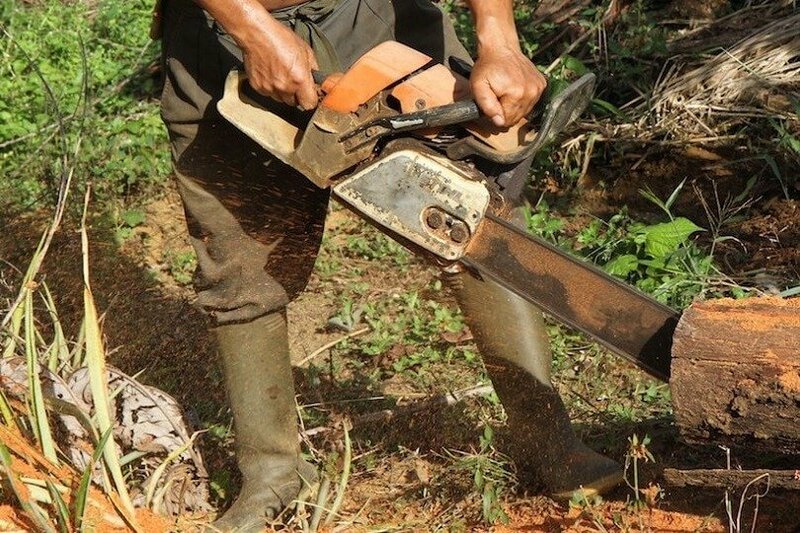 This article covers the basics of felling a tree but make sure you read this article which includes more details on the safety aspects. There are three cuts you need to make to fell a tree. For the first cut, make a horizontal cut about a 1/3 into the tree no higher than your hip. Then, make a 45 degree angle cut upwards, to meet the end of your first cut. The third cut to make is on the opposite side; about 2 inches above the horizontal cut you first made. You should make this cut about 1/10th of the trees thickness. At this point, the tree should start falling, however if it doesn’t you can drive a wedge into the last cut you made to bring the tree down. Debarking your logs is easy, but takes a long time! You should straddle your log and use a drawknife to peel the bark off towards you at around a 30 degree angle. There are so many different ways to notch your logs. Possibly the most popular and easy way to notch a log is a saddle notch. This involves using a scribe to mark out where to cut the log. You should then make vertical cuts with a chainsaw (or regular saw if you are using hand tools) every half inch, and knock out the chunks of wood with a hammer. The notch can then be finished and tidied up using a chisel, and the next log can then be fitted. Once your walls are as high as you want them to be, you need to start constructing two gable walls for your roof joists to sit on. 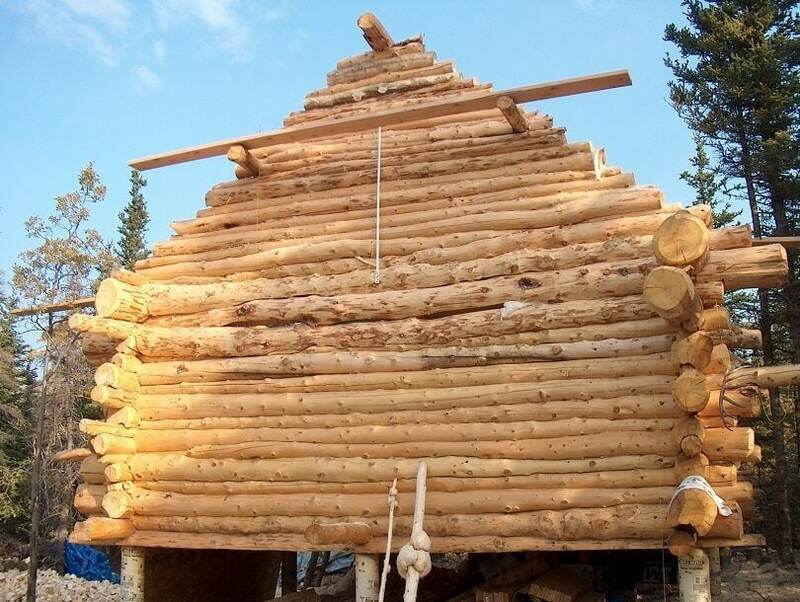 The gable walls form two triangular shapes; your logs get increasingly smaller until you reach a point at the top. You can then add your roofing material. Chinking ensures that logs, which don’t perfectly fit, have a good seal. Most sealants are flexible so they expand and contract as the cabin settles. Chinking is applied in the gaps between your logs to prevent external infiltration (air and water) and heat loss. The two most important areas to insulate are the floor and the roof. Up to 70% of heat are lost from these two areas. You can also insulate in between your logs by cutting a V-shaped groove into the top of each log and padding it with insulation before placing the next log on top. To insulate your log cabin floor, you should place insulation between your floor batons before laying your flooring. Likewise, when you insulate your roof, insulation should be laid between the roof rafters before your moisture resistant membrane and roofing material is laid on top. For a more in depth look at insulation, take a look at this article. Build your own cabin the woods will be hard, but the satisfaction and reward that you will gain from it will far outweigh the hard work. Remember, when you’re building in a forest, the most important things to think about are access to your site, and power supply. Once you’ve come up with a way to transport the materials to your site, and a power source for your tools, then the process of building a log cabin is very much similar to building a log cabin anywhere else. Where are you thinking of building a cabin? What is holding you back? Let us know in the comments below. Do you anything about the rules and permit for building a similar cabin in the himalayan wilderness. Hope this helps – David. I would absolutely love to have one of these cabin things in the forest. I would make mine a tiny house. I have the funds, the planning, the design, the tools but my only problem is where I’m going to build it. I live in Cape Town, South Africa. I really want to build it in the forest in the nature but I’m scared I get in legal trouble or something. Do you know anything about that? I would recommend you take a look at this post. It’s a different country, but, I would suggest there may be commonalities. You should then read National Building Regulations for South Africa.